Well, I was thinking about just not writing anything for this game but then the Bird went and recommended people read my thoughts, so I feel all obligated to provide some. Disclaimer: I watched this game on near-mute with some friends hanging around after a kids Halloween party, so it didn’t have my full attention. From what I saw, it didn’t have the Wings’ full attention, either. I’ll start with the game-winner… Kyle Quincey pinching and getting burned is the kind of thing we’ve come to expect from him. It’s stupid for many reasons and his inability to get back to make up for it just adds to it. That said, it would have been harmless had Danny DeKeyser not come across the ice to cover for him. DeKeyser plays that as a normal two-on-one and just cuts off the pass? Twelve seconds later it’s a shootout. I hate it when defensemen don’t play the two-on-one properly but I hate it when Kyle Quincey makes rookie mistakes, too. Just an ugly play all around. And the stupidest thing is that if Quincey had done what he usually would do and hauled down Pouliot, it’s a Rangers power play for 15 seconds and we probably go to a shootout. So that goal wastes a fantastic effort by Jimmy Howard. Howard stops 37 of 40, including some great stops in the second when the team was under siege. He is not the problem with this team. Allowing 40 shots and getting only two goals against a team that is at the end of an epic road trip, missing several key players, and starting a backup rookie goalie… Well, that sounds more like the Red Wings than I’d like. This is a team that has a history of making backup goalies look good. Cam Talbot made 32 stops on 34 shots and that’s a pretty good night for the kid getting his first win. Was he actually that good? Bird seems to think so but I didn’t see the Wings making him work for it. Specifically, I didn’t see a lot of lateral movement required of him. Even the awesome passing play in the third from Zetterberg to Datsyuk to Alfredsson for a chance only led to a shot by Alfredsson from an angle Talbot was already squared to. As much as I love the Z-Pavs-Alfie line, I don’t get the idea of firing up the line blender before the game and then doing it again for the third period. There wasn’t an injury announcement, so why exactly was Bertuzzi benched for most of the third (supposedly necessitating the line juggling)? It’s not like he was the worst player on the ice at any point of the night. How did he get singled out? I don’t know. I’m not freaking out about the state of the team yet but I’m really disappointed. It feels like the players are just not playing smart, the coaches don’t know what to do about it, and management has put the team in a position where change can’t be made (as there’s no cap space). These are the players we’re going to see this year, they’re the ones that are going to have to turn it around. We’ll see if they can. 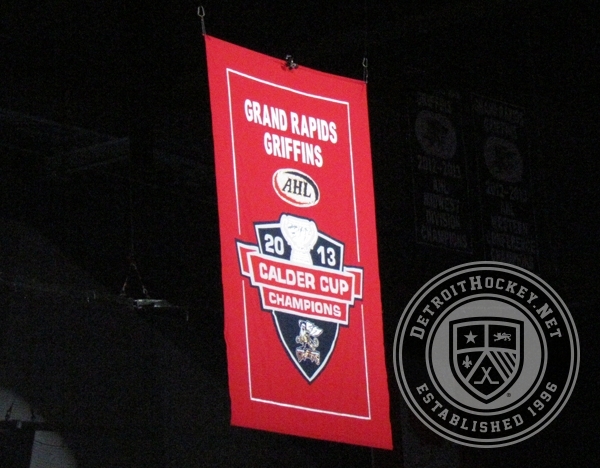 A week ago the Grand Rapids Griffins raised the banner for their first-ever Calder Cup Championship. It’s an incredible accomplishment, of course, and it’s awesome to see that banner hanging at Van Andel Arena. That doesn’t mean the banner looks good, though. The Griffins, who primarily wear a blue jersey and a white jersey (yeah, they have a red alternate), honor their highest accomplishment with a red banner? I get that it somewhat mimics the design of their banners for “lesser” accomplishments, which are blue with white trim, but it doesn’t make a whole lot of design sense to me. That got me thinking about how even the blue banners have their flaws. Why is the logo inside a white oval when it doesn’t appear that way in any other branding? Why is the banner for Travis Richards’ retired #24 so plain? I decided to take a crack at redesigning the banners to give them a look that’s not quite as plain but still traditional and respectful of the team’s history. 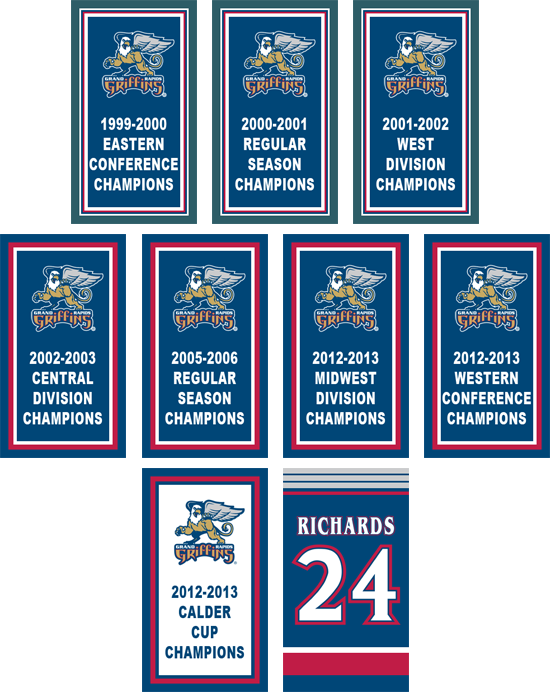 I keep the blue background but update the border to match the trim pattern of the Griffins’ jerseys for the year the banner was awarded. That means a green border for accomplishments under their affiliation with the Ottawa Senators and a red one for their time with the Red Wings. Rather than including the team name in text at the top of the banner, I use the version of the logo that has the name, and I remove the white oval around the logo since it’s not used anywhere else in the team’s identity. Finally, I remove the league abbreviation because with the year included it’s redundant, as it’s not like the Griffins ever spent a single year in both the IHL and the AHL. The Calder Cup banner switches the striping pattern to one based on the team’s white jersey, much as the Red Wings do for their Stanley Cup banners. I don’t use the Calder Cup logo so that there will be consistency across multiple Calder Cup wins. Finally, I take another cue from the Red Wings in redesigning Richards’ retired number banner to look more like a jersey, specifically the jersey he last wore. The top features the now-absent “wings” that adorned the Griffins’ jerseys during Richards’ tenure with the team while the bottom matches the waist striping of those jerseys. Note: I know I didn’t get the number font quite right. Maybe there’s a reason I’m not seeing for the Griffins’ banners to be the way that they are. I’ve complained before that I wish they actually hung from the rafters rather than from the service walkway on the building’s south side but apparently there’s some reason they can’t hang from the rafters that I don’t know about, so that could be the case here, too. That doesn’t stop me from saying how I’d do it, though. As I write this, it’s 6-1 Ottawa over Detroit. It’ll probably get worse before the game ends, with how it’s gone thus far. The Red Wings just had nothing tonight. Outside of a couple shifts in the first period, absolutely nothing clicked offensively and almost everything went against them defensively. Both goalies were victims of that. There’s absolutely no excuse for that. Especially given how much was made of the game as Daniel Alfredsson‘s first against the Senators team he captained for so long. I’m gonna go to bed and forget this happened. The Red Wings had better not. They need to re-learn that this kind of effort (or lack thereof) is unacceptable. The Red Wings host the Senators tonight in former Ottawa captain Daniel Alfredsson‘s first game against his long-time club. Detroit is expected to use much the same lineup as they did in their double-shutout shootout loss to the San Jose Sharks on Monday. The forward lines will remain the same but there could be a change on defense, with Niklas Kronwall returning from concussion to replace Xavier Ouellet. Ouellet had been returned to the Grand Rapids Griffins after making his debut against the Sharks but Kronwall took a puck to the face in the morning skate and may not be able to go tonight, so he was brought back up as insurance. Jimmy Howard will get the start in net. Stupid stat of the day: The Red Wings are 2-2-1 this season against teams for whom one of their current players formerly played. Detroit Red Wings general manager Ken Holland announced on Tuesday that defenseman Jonathan Ericsson is expected to be out two to three weeks with a shoulder injury. Ericsson injured his left shoulder in Saturday’s loss to the Phoenix Coyotes. He missed Monday’s shootout loss to the San Jose Sharks while attending to the birth of his daughter. An MRI later in the day confirmed the injury. Should Ericsson miss the full three weeks, that would be 21 days and nine games, not enough time for him to be placed on long-term injured reserve. The Red Wings host the NHL’s best team tonight minus their top defensive pairing. Niklas Kronwall and Jonathan Ericsson are both out as the San Jose Sharks come to town. Kronwall skated this morning and is expected to return on Wednesday against Ottawa, as he’s experiencing no ill effects from the mild concussion suffered in Colorado on Thursday. Ericsson is out for personal reasons as his wife or girlfriend (depending on who’s reporting, though one would assume they’re the same woman) gave birth to a daughter this afternoon. With both out, Brendan Smith remains in the Detroit lineup and will be joined by call-up Xavier Ouellet, who will make his NHL debut. There are also changes up front, as Luke Glendening has been returned to the Grand Rapids Griffins. Justin Abdelkader is back with Henrik Zetterberg and Pavel Datsyuk, Stephen Weiss centers Daniel Cleary and Tomas Tatar, Johan Franzen centers Todd Bertuzzi and Daniel Alfredsson, and Joakim Andersson centers Drew Miller and Jordin Tootoo. Mikael Samuelsson will be the healthy scratch. Stupid stat of the day: The Red Wings are a perfect 3-0 all-time against teams from California on October 21. With tonight’s game, they will have played each of the league’s California-based teams exactly once.